Here's the short list of my Oscar choices for 1982, if I were allowed to vote -- a more detailed nominees and winners list will be up here soon! BEST ACTOR : Ben Kingsley in "Gandhi"
BEST ACTRESS : Meryl Streep in "Sophie's Choice"
BEST SUPPORTING ACTOR : Lou Gossett Jr. in "An Officer and a Gentleman"
BEST SUPPORTING ACTRESS : Jessica Lange in "Tootsie"
BEST DIRECTOR : Richard Attenborough for "Gandhi"
BEST ORIG. SCREENPLAY : E.T. 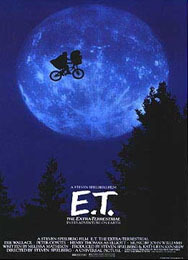 BEST MUSIC - ORIGINAL SCORE : John Williams for "E.T."